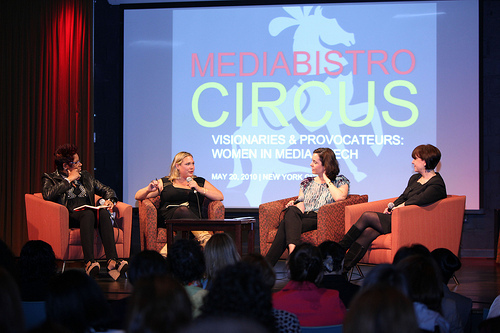 At a recent Mediabistro conference, innovative women across diverse industries came together to discuss the state of media today and where it’s headed. From speaker to speaker, two key trends kept working their way into the conversation: personalization and community. Who is in the community behind your brand? They’re speaking to you with every purchase, telling you everything you need to know to guide your brand. You need to learn everything about them, because this community of brand loyalists will inform how you market to those outside the core community. Behavior-based media began in the digital space, because behavior there is easy to track. Out of home will soon follow suit as technology catches up, and we’ll see more marketing initiatives based on behavior tracking. Eventually (some folks, like Amazon.com, are already doing a great job at this) we’ll be predicting the future through analytics, instead of “old school” trial-and-error. Phil Lempert, a California grocery industry analyst, was recently quoted saying “The war this time is going to be on more intelligence. More targeting. More using social media. And price will be a factor, but the impact of the price is going to be lessened.” Price and value may be what the conversation’s been about, but analytics and targeting are where it’s going. While it may seem to some like an invasion of privacy now, consumers will begin to expect goods and services offered to them based on prior purchases or behaviors, both online and in store. Will you be ready? Great post! I completely agree that marketing is moving towards personalization and community development. The tools are already available which is why I’m surprised that there aren’t more companies trying to reap the rewards of engaging their customers in this way. It will be interesting to watch how organizations adapt and what they do to improve the customer experience. Thanks Josh. I agree with you and I think as more marketers learn to adopt these tools they will be able to better measure their efforts which seems to be the biggest issue right now in this space.